Oracle Blockchain Cloud Service is a new offering that is part of Oracle’s comprehensive platform-as-a service, more particularly part of our modern Application Development portfolio. In alignment with Oracle PaaS strategy, each new service can be deployed in its own right to deploy for customer projects, but is very much designed to deliver best value add in combination with other Oracle PaaS, SaaS and on-premise Applications, leveraging our IaaS components and choice of deployment. 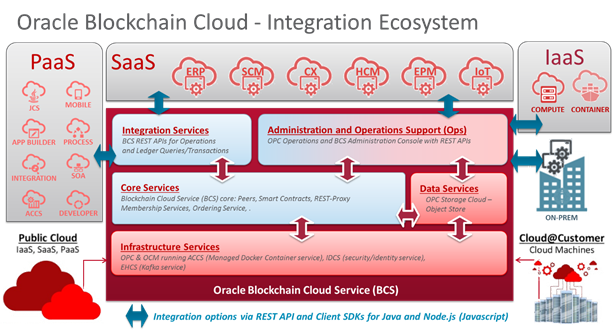 Two other key capabilities of Oracle Blockchain Cloud Services are the possibility to set up a turn-key sandbox environment for corporate IT developers and ISVs and the ease of on-boarding and connecting members and creating and supporting smart contracts. Both will enable you as a partners and your customers to kick off internal projects very easily and promote these to a production environment quickly and at scale. To get you up to speed on blockchain, we would recommend the following article: What Is Blockchain Technology? A Step-by-Step Guide for Beginners. And visit the Blockchain pages on oracle.com for technical explanation and listing of different use cases.